Your boat is a huge investment and The POLY LIFT can help you protect that investment. POLY LIFT has been designed and engineered by a team of professionals with many years of experience within the boat lift industry. 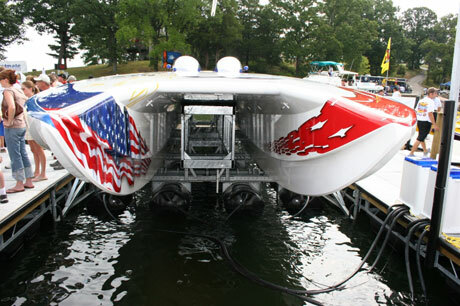 Hydro System Inc., the manufacturer of The Poly Lift Boat Lift, has been in business since 1975. 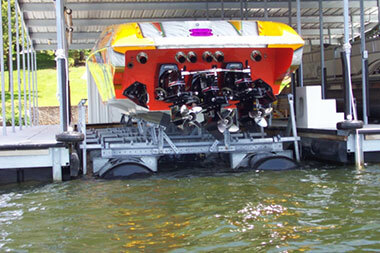 Hydro Systems™ Inc. started in the boat lift industry in 1975. 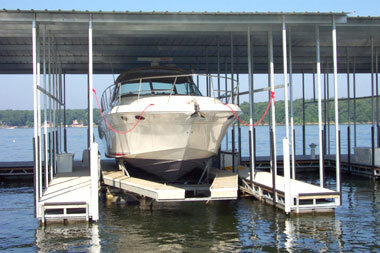 As boating conditions changed, they saw the need for a higher quality, more dependable, hassle-free boat lift. This lift would give users the peace of mind of knowing that their boats were protected in nearly any situation. Since then, through innovative design, the POLY LIFT ® has set the standards for quality, customer satisfaction, and performance in the marine industry. Maybe the most important attribute of Hydro Systems™, Inc. is that they are also boaters. They enjoy boating and understand the joys as well as the problems and concerns of owning and caring for a boat. Their staff has been responsible for several engineering advances within the boat lift industry. They were the first to introduce the use of polyethylene as flotation for tanks. The use of our Poly tanks significantly reduced the downward load on a dock when a lift is fully submerged. They were also able to increase the warranty on the floatation (tanks) from a set period of time to lifetime! They were the first to use ultra high molecular weight plastic for bushings. This bushing material, along with their structure, allowed them to add life and reduce the noise of a boat lift dramatically. Because of this, they were able to extend the warranty on the structure and bushings to 5 (five) years. They also increased the warranty on the control unit to 2 (two) years. Their lifts have an easy to use 1 handle per motor operation control unit. The control unit is carefully designed to be easily operated. The control unit handle(s) turn in the same direction instead of turning one handle to the left, one handle to the right, and turning a third handle to an alternate position. Does it cost more to do all of this? You bet! They are always willing to improve their products and add an expense if theye feel the customer will benefit from an improvement.They do not claim to be the cheapest and do not want to be. They do want to stay in touch with their customers while maintaining their position as the manufacturer of the finest constructed, most dependable pneumatic boatlifts in the world. While they don't claim to be perfect, they strive to be the innovators not the imitators in this business. Thank you for your time and consideration of their product line as they continue to find new ways to meet our customers’ needs. Regardless of the size of your power boat or sailboat give us the opportunity to quote on your specific requirements. The POLY LIFT® can be adapted to nearly ANY situation.